‘Ciudad Doméstica’, a way to connect the home to the city. 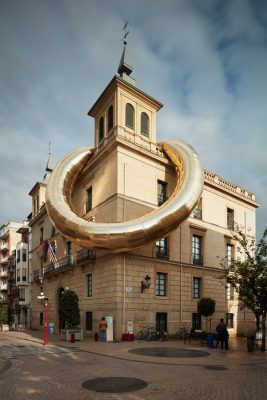 The visitor approaches an experience in which the representation of a home blends with the city plan of Logroño, through an installation inside a container. The layout of the streets and blocks seizes this inner space in a continuous way, blurring the boundaries of the pieces of furniture that arise from the floor and the wall. Bringing the urban scale closer to the domestic scale, linking the ways of inhabitating the public and private space, talking about our daily life, belonging to a place, understanding the city as owr own, as an extension of the domestic space … It comes from the thought of how we live the city and how we build the common space. It is from that point that ‘Ciudad Doméstica’ begins. From understanding the city as our own, our own home. Trevijano. Logroño (La Rioja) Spain. Javier Peña (1985, La Rioja) is a Madrid-based creative and researcher of contemporary architecture and design. Trained in Architecture at Politécnica University, at the Escuela Técnica Superior of Madrid, ETSAM, Javier specializes in the promotion and research of citizen participation, in order to generate a critical dialogue on the limits of architecture, through media, architectural practice and video-art. Muebles Tuesta. Nájera. La Rioja. Enterprise devoted to the exclusive furniture manufacture, interior design and decoration. Muebles Tuesta, with more than 50 years of experience, has known how to adapt the knowledge of its origins in carpentry to the current needs of the market. Some of the collections are carried out collaborating with art, designer and architecture professionals. The aim is that each project is a unique creation.